Part I of my Leading By Design posts identified common hindrances to creating a sustainable art-focused business, which relies on dynamic design style to remain at the forefront. In this installment we’ll explore ways to implement original ideas to avoid becoming stagnant. When you view artwork, you experience an instinctive reaction, which may be positive or perhaps it is negative. The key is understanding your response. If you can identify the elements that triggered the response, you will garner information that will assist in improving your own work. If your eye recognizes pleasing design, yet you don’t seem to be able to create without duplicating what you've seen, then this suggests that you are missing the why factor. In order to understand and create, you need to be able to define what is pleasing (or not) about the design. Ask yourself why the design is appealing or unappealing. Is it color, flow, shape, layout or something else? Next, expand each of these observations. For example, if it is the color combination to which you are drawn, begin by identifying the dominant color. What is it's hue? Is it warm and inviting, or cool and crisp? Is there an array of supporting colors or just one for contrast? Is there a pattern among the designs that you find pleasing? Do they repeat a series of colors? Is the same color or group of colors always predominant? Apply your observations, garnered from a variety of subjects, to your own work. By using a diverse assortment of artwork to train your design sense, you will avoid shaping your views based on a single designer whose work you enjoy. For further reading see Secrets to Success: Developing Your Own Style. Just as your interests evolve, so should your art. Follow your passions and create from what you know, then explore what you don’t know. Pick up an art supply simply because it is something that you have never tried. Now, and this is key, you need to actually use the new item. It won’t be creative on its own. Within the boundaries of safety precautions, use it in a way that is not prescribed. For example, RB Stenciling Gel was originally developed as an embossing medium that allowed the artist the freedom to create the look they wanted rather than be limited by off-the-shelf texture pastes. Stick with me here, this is not an advertisement, but an illustration. The gel can be used as-is to create crystal clear embossing, tinted, made opaque, pearlescent, iridescent and so on. By experimenting I discovered that it is a fantastic non-toxic craft glue because it bonds with acrylic paint, it will work on a variety of surfaces and can be used for image transfer. I also created a faux leather process. Through other artists using and experimenting with RB Stenciling Gel I have seen it used to create beautiful ornaments by piping the gel onto frosted Christmas balls and it has also been used as a medium to facilitate the bonding of acrylic paint with copper art, adding both color and dimension. But I digress. To remain inventive, take some time to explore media and styles outside your comfort zone, or create new imaginative uses for products that you already use like those unique applications described above. A busy designer will often resort to what has worked in the past at the risk of becoming stagnant. To free up some time, learn to say no; an overwhelmed designer is not an innovative one because they have no time to experiment and enjoy some creative play. Set aside time on a regular basis so that you can explore new ideas. A designer who wants to remain successful must also resist pressure to continue producing a singular style in order to please an existing base. These followers will grow, their tastes will evolve, and they will move onto other interests. If you have not stayed on-trend or been trend-forward, creating new styles and techniques, you will not have gained new followers to replace those lost plus your work will soon appear dated. Listen, but stay true to your inner voice. After all, that's what brought you to where you are. Many will want to influence your decisions and, while trying to be responsive, you may lose your way. Opinions are often proffered with a personal interest in mind. "I love 'this feature' about your work but, have so many supplies already. I just don't want to invest in a new medium or purchase a new creative tool, learn a new technique, etc." They may suggest that you avoid using unique accessories or tools to create special effects or forego incorporating special mediums and such. What they overlook is that your style, whatever it may be and using whatever unique methods or tools you employ to create it, is what has drawn them to your work. Eliminating any part of that will remove an element that was a factor in engaging their interest. See previous point. From my perspective, simplicity is overrated. This view doesn’t work for everyone (and it shouldn’t or we would all design the same). To me, plain backgrounds have no character; pristine petals make monotonous flowers (how about a bug bite? ); and all work and no play makes Jack a dull boy. Okay, that last one is not original but it does illustrate my point. Without some creative play you become bored and as a result, your art becomes boring, i.e., stagnant. A bored artist produces boring art. So mix it up a bit! What exercises do you employ to spark creative ideas? Imagine that you have four hours. No interruptions, no responsibilities. How would you use this block of unstructured creative playtime? You can share your thoughts here. 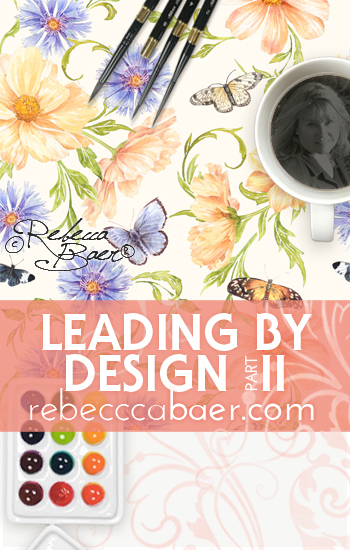 Copyright Rebecca Baer®, Inc. | All Rights Reserved.